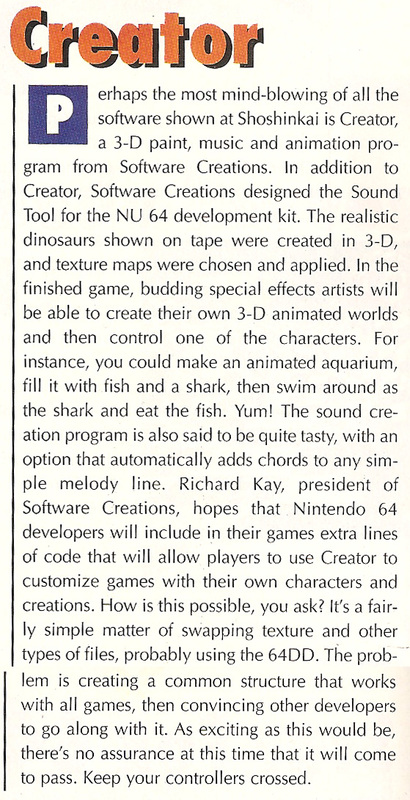 One lazy morning at school, I was handed a copy of Nintendo Power Volume 80 -- and, through its pages, was formally introduced to the Nintendo (Ultra) 64 and 3D gaming in general. The console wouldn't be out for another nine months, but its screenshots looked like nothing I'd ever seen before. Up to that point, just about all games were set on a 2D plane. Being able to freely walk around a 3D world was a new novelty. The Saturn could barely do it, but it didn't look good. The Playstation could do it somewhat better, but nobody was paying attention to the Playstation this early. 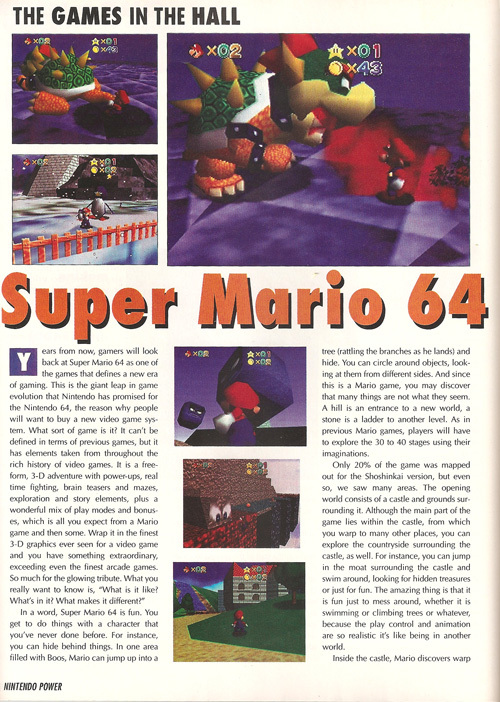 The most immersive 3D experience you could have was Doom on the PC, and that amounted to walking around a maze while demon sprites harrassed you -- hardly the free roaming Super Mario 64 was promising. I wanted to play Creator most of all. I wanted to make a shark and become it! But this game-making game, which promised to give you the power to create entire 3D worlds, was never released as described. A reduced-scope version of it called Mario Artist came out for the Japanese 64DD, but of course that entire add-on bombed in its home region, so we never got our own copies. It took 23 years, but.....someone finally made this game. There is finally a game console that lets you create virtual landscapes and gives you the ability to run around in them. But it's the Playstation 4, not the Nintendo 64. Dreams is the invention of Media Molecule, the UK-based development studio reponsible for Little Big Planet (which was a similar bit of game-creating software only strictly 2D). Dreams is much more advanced, and capable of so much more than what I daydreamed about that day in class. I was selected for the closed beta test last January, and here's what I saw. While Dreams is easy to start, you won't master it in a day. The software is pretty darn powerful, but it doesn't reveal all its cards at once for fear of overwhelming you. You MUST start with the tutorials, and new options only become available when you've proven your skill with the ones you have. In the beginning, Dreams simply plops you into a sparse nothing-world and teaches you the basics: how to select, how to lift, how to stamp, and how to take control of avatars and explore. Find everything in the area and you're granted access to the main menu. The sheer EASE with which you can create environments is awesome, and you can make them in no time flat (though if you want something that looks GOOD, that takes a bit more time). This is the one game where the PS4's motion controls are a huge help, as they let you use gestures to place objects in 3D space. You can make any kind of dream you want....a piece of art, a model, an animated short, or a game in any genre. It all boils down to your skills with the software and the limits of your imagination. 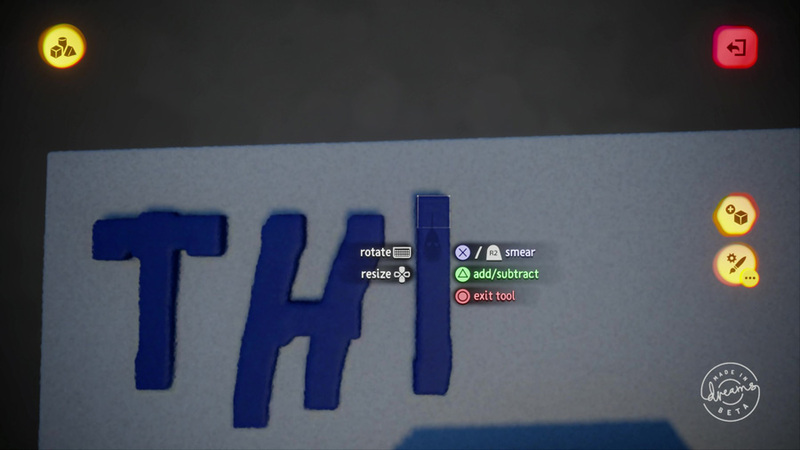 And what the testers had already created in the closed beta was insane. You're granted access to DreamSurfing, the menu that lets you check out other people's Dreams, fairly early on. You can sort the uploaded Dreams by category, tag, subject, genre, popularity or what's new. It's those last two that demonstrate the extremes of what you'll find on Dreams, and they mirror the same type of trends that exist in other DIY programs. Many of the most popular and high-voted Dreams were simply recreations of pre-existing properties. A Dreamiverse recreation of Kokiri Forest from Ocarina of Time was heavily visited....in fact, two separate people had uploaded that idea at the same time. A mockup of the first level of Super Mario Bros was shockingly authentic, though the controls were definitely not the same. Someone had even managed to recreate the entirety of Konami's pulled horror demo P.T., but I do not have footage of it here because I was just too chicken to try. 3D Block Builder: Yup, it's Minecraft, or a severely limited version of it. A smaraleck might ask "can you use this game maker to make a game maker?" Yes you can and someone already did it. 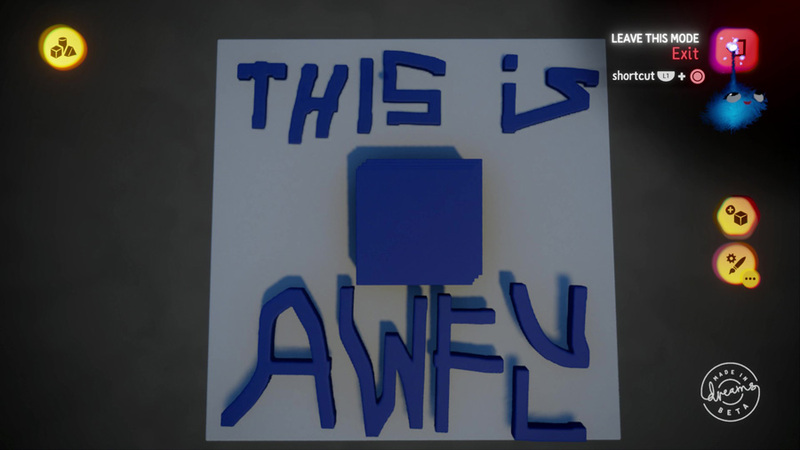 Before the game's official release even. The Encounter: This was one of many environments that looked professional enough to pass off as its own product. It's possible to create some INCREDIBLY realistic environments in Dreams, though these are almost always hallways and corridors. Organic life is a lot trickier. Rigging was not one of the easily mastered skills among the uploaders. It was quite common to witness characters flopping around with loose limbs, backs diagonal, walk cycles thoroughly unconvincing. For those willing to take the time, though, rigging has potential beyond Dreams. There were a few uploads that were simply models with parts manipulatable by PS4 controller buttons. One could rig up one of these models and puppet it around, creating a fictional cartoon host for a live web stream. Just one of many potential outside-the-game applications. If you're searching for inspiration, Dreams hosts weekly Community Jams where Dreamiverse denizens are given a topic or a word -- in the case of the above contest winner, the word was "robots" -- and given free reign from there. This is a pure example of the kind of Dream you should aim for: something that takes you into a fascinating world, just long enough to leave you wanting more. Is there a limit to how big a Dream can be? I didn't play long enough to find out. Some of the builds were rather large (there was an attempt to create the entirety of Tomb Raider in one). I spotted a few complaints in the comments about something called a "thermometer" that was implied to measure storage space, but I never ran across such a thing. Getting back to "popularity" vs "what's new." Sticking to the popular play track in DreamSurfing will get you a lot of awe-inspiring, yet safe and predictable Dreams. But loading up What's New, where the selections are truly random...that way lies madness. They named this game well, as "Dreams" is the precise word that can describe a lot of these ethereal experiences. The ones that appear at random are strictly of the "fever" variety, and some can be outright nightmares. This last one is Superman 64 only you're a pig. 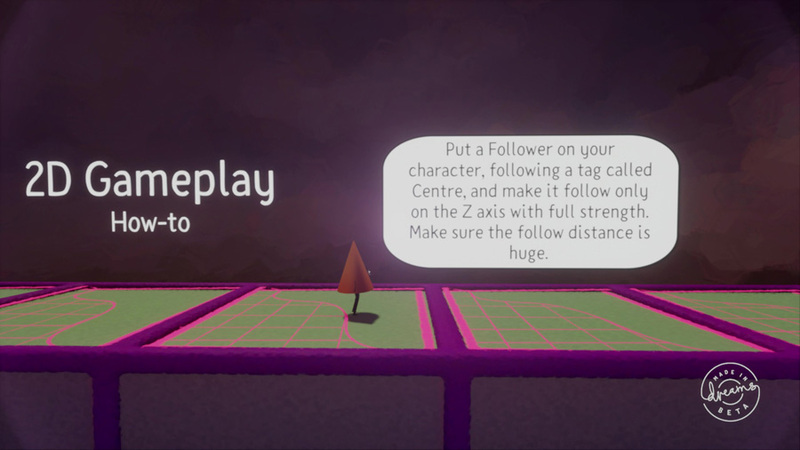 If there's something you REALLY want to do and you CAN'T wait for the tutorials to get you there, Dreams has plenty of shortcuts. The beta community came up with dozens of tutorials that showed me how to pull off a specific look or how to emulate a certain genre. You can also load someone else's Dream into your personal Dreamiverse and pick it apart for parts, but be aware the game will automatically credit that other Dream as part of your own. Your cheat will be exposed. Someday I'll be able to work great wonders with Dreams, but not today. It's too bad Dreams isn't being marketed as a legit creation tool, and that it has to remain shackled to the PS4. As it is, if you want to make a professional animated short, you have to use separate software to draw the textures, make and rig the models, create the environments, record the dialogue and score the music. Each of these tasks requires mastery of its own distinct program, with its own rules. In Dreams, everything you need to make a CG short is in one package. Imagine if someone came out with all-in-one software like this for the PC. They'd rule the world, right? Animation studios around the world would save so much money, and animators would save so much time. The problem is, it took a lot of investment to make Dreams happen -- its first trailer appeared at E3 back in 2013. Adobe won't spend years of R&D on one Megaprogram when they can just charge separately for the segregated ones they already publish -- and make a lot more cash that way. It'll take a competitor to see this through. I would do it myself but I don't have the billion or so dollars necessary to make it happen. 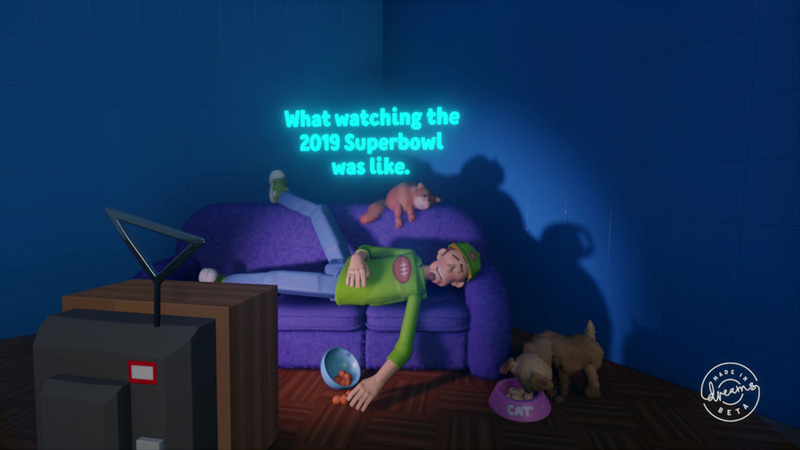 Dreams enters open beta April 16, 2019 on Playstation 4 -- more Dreamers will be allowed to register than the closed beta, but will still be restricted to an unspecified number.